Robert Treskillard in his new book “ Merlin’s Nightmare” Book Three in The Merlin Spiral series published by Blink gives us another adventure with Merlin. From the back cover: Haunted by the past, chased by the present. Arthur is now eighteen, and Merlin, tired of hiding and running from his enemies, wants nothing more than to spend his days with his family and train Arthur for his rightful place as king. But when Arthur goes missing, a desperate Merlin must abandon all other quests to find him before a shadowy pursuer catches Arthur first. At the same time, Mórgana brings Merlin’s deepest fear to life and sets a horde of werewolves loose to destroy Britain. But when the secret purpose of this nightmare is finally revealed, will Merlin and Arthur find a way to survive—without unleashing an even greater evil? Just say the two words, Merlin and Arthur and, immediately, you know you are in for a good time reading the story. Mr. Treskillard continues the story of Merlin and Arthur and brings them an adventure they are unprepared for. The enemy is gathering on three sides and Britain is severely challenged. It has been eighteen years and Merlin and Arthur are leading somewhat normal lives, almost like a normal family. However this is not to be. Arthur runs away hoping to join in the fight without telling Merlin leaving Merlin to drop everything to find him before the bad guys do. This is exciting stuff. There are multiple epic battles not only on the battlefield but in Merlin’s mind. The duo are pushed to the brink of doom more than once and just barely escape to continue the fight. “Merlin’s Nightmare” is an epic battle between good and evil. Mr. Treskillard has done an incredible job of bringing his characters to life and we root for them to win against overwhelming forces. 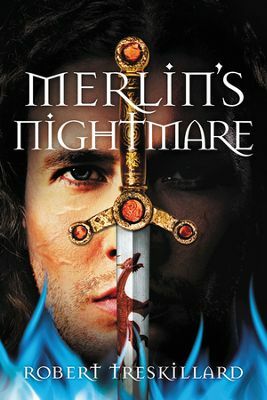 “Merlin’s Nightmare” is a wonderful, interesting story with power and depth that will keep you flipping pages. While The Merlin Spiral series ends now it will pick up again in Mr. Treskillard’s next series, The Pendragon Spiral of which I am so looking forward to. Thanks for sharing your thoughts, I too am looking forward to the Pendragon Spiral. Great summation of the book. It’s so exciting, I’m a little more than half-way through— I started it this morning— and I’ll have no problem finishing it by tomorrow. I really like your blog and would love to chat with you about your reviews. I can’t find contact info for you here, however!